The history of the human race is a history of revolutions: agriculture, pottery, religion and wars all defining our development as a species. When we think of the Industrial Revolution we think of William Blake’s ‘dark satanic mills’ or of Dickensian characters in dark slums and towering factories. Across the globe, canals, factories and cities stand as testament to the changes wrought by that revolution. You might be tempted to think that our most recent, the digital revolution, will not leave any such mighty edifices. That our modern world is thanks to mysterious wafers of thinking silicon, and those temperamental little plastic boxes everyone now has in their homes and offices. In actuality, smartphones and routers are just the tip of the iceberg, and would be next to useless without the masses of hidden infrastructure which support them from below the water line (in some cases literally!). I say ‘hidden’, but the infrastructure behind the internet is actually one of the largest engineering achievements in human history. The only reason we don’t notice it is that it tends to be occur under the ground, on the bottom of the ocean, or tucked away in some remote location. As with industry of the past, our digital infrastructure is limited and dictated by our economic requirements and by the natural resources available to us. Our connected economies rely upon great networks of undersea cables, vast data centres, satellites, exchanges and mile upon mile of fibre optic cables creating the web that increasingly connects us all. This infrastructure is not cheap, neither in investment nor in operational and energy costs. 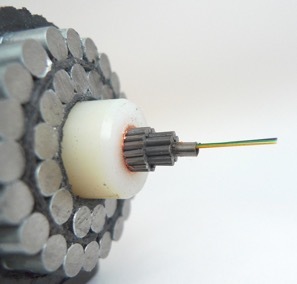 Image: An undersea fibre optic cable. Those three little yellow, green and blue fibres can handle internet requirements of several million people. Data centres represent the hubs of our new digital world, storing data and providing the services required by our information hungry economy. The huge quantities of data produced daily (2.5 quintillion bytes according to IBM) has to go somewhere, and this resource is housed in some truly colossal high tech warehouses. Keeping these data centres humming with the sound of all our social media updates, GPS signals, sensor data and all the almost infinite ways we express ourselves online, is no easy task. Even cooling these systems incurs a huge energy cost, so much so that increasingly these centres of our digital world are being housed in Arctic locations. In Norway, the carbon neutral ‘Green Mountain’ data centre is cooled by a constant supply of fjord water at a cool 8 degrees Celsius. As coal and shipping dictated the location of our industrial revolution, energy is increasingly shaping our digital revolution. Tens of thousands of miles of fibre-optic cables in over 300 different cable systems physically connect our seemingly ‘wireless’ world wide web. The only continent not physically connected to this global network is Antarctica, with some cables in the Pacific lying almost as deep as Mount Everest is high. Undersea cables transmit huge amounts of data, and form a network that has to be robust enough to survive earthquakes, extreme weather, sabotage and overzealous fishermen. Next time you access a server in the United States, the chances are that the information you’re after has to travel through the unlikely transit points of this huge network. Goonhilly Downs in Cornwall, for examples plays a pivotal role as landing point for a number of crucial trans-Atlantic cable systems. As the web plays an ever more important role in our day to day lives, and as the data we as a society produce increases, this complicated global infrastructure is only going to increase in significance. Data stored in Cold-War era bunkers, powered by geothermal energy and cooled by Arctic currents, is not the stuff of Hollywood, it’s the reality behind cat videos and selfies all across the globe. Our digital revolution may have been invisible in many ways, but it is underpinned and sustained by some amazing feats of engineering and international cooperation. So spare a thought to that network when you next upload a photo of your lunch. There is a parallel between the internet as a whole and data science as a service. The internet, and all that comes with it, is only possible thanks to the unification of computers and data centres around the world. That act of unification and communication is where the magic happens. Not in the smart phone or the router or the web browser. The Uber app, for instance, would be useless without the constant stream of data it receives from drivers. Similarly in data science, it is the unification of data where the magic happens. Without a solid data foundation, all the fanciest algorithms and reporting software in the world are worthless. Hugo brings a decade of blue-chip consumer marketing experience into the mix, and when we say “chip” we mean it literally – in a previous life he was the man behind Walkers Crisps digital success. Hugo is expert in delivering cosmic insights to our clients and is passionate about technology and data. He loves a bit of rugby and will also often be found strapped to a pair of skis. Hugo brings a decade of blue-chip consumer marketing experience into the mix, and when we say "chip" we mean it literally - in a previous life he was the man behind Walkers Crisps digital success. Hugo is expert in delivering cosmic insights to our clients and is passionate about technology and data. He loves a bit of rugby and will also often be found strapped to a pair of skis.